This article is about the company founded in 2007. For the company created from the assets of Fisker Automotive, see Karma Automotive. For the company founded in 2016, see Fisker Inc. For other uses, see Fisker (disambiguation). Fisker Automotive was a firm which made the Fisker Karma, which was one of the world's first production plug-in hybrid electric vehicles. It debuted at the 2008 North American International Auto Show, and first deliveries were in 2011. Production of the Fisker Karma was suspended in November 2012 due to bankruptcy of its battery supplier A123 Systems, with about 2,450 Karmas built since 2011 and over 2000 cars sold worldwide. In February 2014, the company's designs, engineering and manufacturing facility were purchased by Chinese auto parts conglomerate Wanxiang Group. Henrik Fisker retained the Fisker trademarks and the Fisker brand, and so Wanxiang named its new company Karma Automotive. Henrik Fisker cofounded Fisker Automotive in 2007 with Fisker Coachbuild partner Bernhard Koehler and Quantum Technologies after securing a relatively small investment from an Italian businessman, and Palo Alto Investors. Fisker is responsible for designing many premium cars such as the Aston Martin DB9 and V8 Vantage, Artega GT, and BMW Z8. He also served as design director and sat on the board at Aston Martin. Before Fisker Automotive, Fisker and Koehler left Aston Martin in 2005 to establish Fisker Coachbuild, in an attempt to revive the art of coach-building automobiles to customer specifications. The Fisker Tramanto and Latigo used chassis and power trains from Mercedes-Benz SL and BMW 6-Series automobiles. Several were purchased, but the business soon gave way to Fisker Automotive, a true automobile manufacturer. In 2009, Fisker mentioned plans for another plug-in hybrid, a "high-volume vehicle for a lower price", subject to getting a U.S. Department of Energy loan to build about 100,000 vehicles annually in the United States. On April 14, 2008, Tesla Motors filed a lawsuit against Fisker Automotive, alleging they stole Tesla's technology and were using it to develop their own hybrid car, the Fisker Karma, which was announced at the North American International Auto Show in January 2008. Tesla's suit claimed that the design work done for the Model S by Fisker Coachbuild was substandard, and that Fisker diverted its best ideas to the Karma. In early 2009, the suit was settled in Fisker's favor and Tesla was ordered to pay Fisker more than US$1.1 million in legal fees. Fisker received a US$528.7 million conditional loan in September 2009 from the Department of Energy's US$25 billion Advanced Technologies Vehicle Manufacturing Loan Program (ATVM). Of the total loan amount approved, a total of US$192 million was drawn by Fisker Automotive for engineering work with primarily US suppliers to complete the Fisker Karma and Fisker's Project Nina, later revealed as the Fisker Atlantic. Vice President Joe Biden attended the October 27, 2009 announcement that Fisker Automotive would take control of the Boxwood Road Plant (previously owned and operated by General Motors as Wilmington Assembly) in Wilmington, Delaware, with production scheduled to begin in late 2012. Fisker's problems started with recall of its battery by A123 in December 2011, followed by a second recall by A123 Systems in March 2012 and eventually a bankruptcy of its battery supplier A123 Systems in August 2012, the costs involved regarding a recall and repairs to customer cars. In addition to production stopping for over five months, with no date announced to recommence, the planned production of the second model, the Fisker Atlantic, was postponed, together with the cessation of development of the new model. The Department of Energy froze Fisker's credit line in May 2011 after US$192 million had been drawn, and after differences between the DOE and Fisker on the milestones set as conditions for the loan. The loan received additional scrutiny for being awarded for the manufacture of luxury vehicles that are too expensive for much of the general public. Fisker investor Ray Lane responded that the issues were being blown out of proportion due to election-year politics. In February 2012, Tom LaSorda was named the new CEO, and Henrik Fisker became executive chairman, but six months later on August 14, La Sorda was replaced by Tony Posawatz, previously General Motors Vehicle Line Director for the Chevrolet Volt. In April 2012, Fisker announced it had received US$392 million in a new round of financing. The company suffered a setback on October 29, 2012, when Hurricane Sandy flooded and destroyed its entire European shipment of 338 Karmas at Port Newark, New Jersey. Sixteen of the cars burned, because six to eight feet of seawater caused a short circuit in a vehicle control unit in one Karma, and high winds spread the resulting fire to 15 others. The company said that its lithium-ion battery was not at fault. Insurer XL Insurance America initially denied the roughly US$30 million loss claim and was subsequently sued by Fisker in New York State Supreme Court. The case was settled with an undisclosed out-of-court agreement. Henrik Fisker resigned in March 2013, after "disagreements with management", in particular "disagreements over business strategy". Shortly after the departure of Henrik Fisker from Fisker Automotive, on April 5, 2013, Fisker laid off 75% of its workforce, retaining only a core group of 40 workers as it continued to negotiate with prospective investors. On October 11, 2013, Hybrid Technology LLC agreed to buy Fisker's defaulted government loan at a heavy discount. On November 22, 2013, Fisker filed its Chapter 11 bankruptcy case. Concurrently, on November 23, 2013, Fisker agreed, subject to bankruptcy court approval, to be acquired by Hybrid, owned by Hong Kong billionaire, Richard Li. However, at the last moment, Chinese parts supplier Wanxiang Group submitted a competing bid of US$24.75 million, supported by the Official Creditors' Committee in the case. Wanxiang had earlier lost out to Hybrid in bidding for purchase of the government's loan to Fisker. Wanxiang owns A123 Systems LLC, Fisker's former battery supplier, and Fisker argued that Wanxiang's conduct was partly responsible for Fisker's business failure. As part of its bid, Wanxiang proposed restarting production of the Karma. Wanxiang received court approval on February 18, 2014, to buy the assets of Fisker after a three-day auction against Hybrid with a bid of $149.2 million, with bidding starting at $55 million, significantly more than the previous $24.75 million bid, and significantly higher than the $25 million Hybrid Technology LLC paid the Department of Energy for a $164 million loan note. On top of the $25 million, the DOE also recouped $28 million from Fisker for a total of $53 million recovered of its $192 million loan. Following Fisker Automotive's structured bankruptcy auction in February 2014, Henrik Fisker retained the Fisker brand name. Wanxiang Group bought the company's assets, which it turned into Karma Automotive, launching the Karma Revero plug-in hybrid car based on the Fisker Karma. The Karma was a plug-in hybrid luxury sports sedan produced by Fisker Automotive and manufactured at Valmet Automotive in Finland. After missing its initial late 2009 launch, and after the launch was rescheduled several times, the first deliveries took place in the U.S. in late July 2011 and deliveries to retail customers began in November 2011. The 20.1 kWh (72.36 MJ) lithium ion rechargeable battery in each car came from A123 Systems in Watertown, Massachusetts. The aluminum frame was engineered by Fisker and was supplied by Norsk Hydro from Norway. The cabin interior was designed by Fisker Automotive, but was made in the United States by Magna International of Canada. The EVer powertrain system, technically a series hybrid, delivered over 400 horsepower, and was inspired by Quantum Technologies, a cofounder of and early investor in Fisker. A version of the Karma was relaunched as the Karma Revero in 2016 by Karma Automotive. Fisker unveiled the Karma S hardtop convertible concept in 2009. The Fisker Surf plug-in hybrid concept car was unveiled at the 2011 Frankfurt Motor Show. The Surf would have an all-electric range of 50 mi (80 km) and an additional 250 mi (400 km) when the gasoline engine is engaged, acting as a generator to charge the battery pack. Like the Karma, the Surf operates in Sport or energy-saving Stealth modes. In Sport, the car can reach 60 mph (97 km/h) from 0 in 5.9 seconds and the maximum speed is 125 mph (201 km/h). According to Henrik Fisker, the Surf would be part of the company’s lineup and would be available for North American and international delivery in 2013. Price was expected be in the same range as the Karma. In early 2012, the company announced they were dropping their plans to produce the Surf and the Sunset. Instead, they decided to proceed with production of the Fisker Atlantic. In April 2012, Fisker unveiled their model Atlantic at the 2012 New York International Auto Show. The Fisker Atlantic, originally called "Project Nina", shares the range-extender system from the larger Karma, but uses a four-cylinder BMW-sourced gasoline engine, which acts as a generator to keep the batteries charged. The Atlantic is rear-wheel drive, with the option of four-wheel drive. The expected all-electric range is 30 mi (48 km). The Atlantic was scheduled to become Fisker Automotive's second production car, after plans to produce the Fisker Surf and Sunset variants of its full-sized Karma were shelved earlier in 2012. Production was initially scheduled to begin by the end of 2012 at former GM plant in Wilmington, Delaware. By October 2012, the carmaker decided to postpone production for late 2014 or 2015 due to financial constraints. By February 2012, Fisker had established 45 dealerships in the US and three in Canada. By March 2012, the company had built over 2,450 vehicles, with over 2000 cars delivered to customers by the end of 2012,. Fisker Automotive distributed vehicles through a traditional dealer network and partnered with five importers: GP Supercars (Merano, Italy), Nellemann (Copenhagen, Denmark); the Emil Frey Group (Zurich, Switzerland); BD Otomotive (Istanbul, Turkey) and Al-Futtaim Group (Middle East and North Africa). Fisker Automotive used to retain core competencies, such as design, engineering and marketing, in house, but outsourced manufacturing of its first vehicle Fisker Karma. Fisker's outsourcing methods allowed the company a 2–3 year period of development instead of the typical 5 years and at a cost of US$333 million instead of $1 billion, and claimed that it could make a profit from selling just 15,000 cars. Fisker used to save significant development costs by using pre-engineered components developed by other car companies whenever possible, such as the door handle mechanism which was a General Motors part; Fisker Automotive just paid a royalty to GM for each door handle in the Karma, which was much cheaper than designing its own door handles. However, the A123 battery failure and its resulting recall, and the eventual bankruptcy of the battery supplier, led to significant problems and added cost to the manufacture of the Karma model, finally resulting in Fisker's bankruptcy. In 2008, Fisker estimated 15,000 cars per year would be assembled by Valmet Automotive in Uusikaupunki, Finland. Manufacturing eventually commenced in 2011 but by the third quarter of 2012 production ceased. Fisker Automotive's investors have included Leonardo DiCaprio, Palo Alto Investors, Kleiner Perkins Caufield & Byers, Qatar Holdings, LLC, A123 Systems, and Ace Investments. In April 2012, Fisker announced it had received $392 million in a round of financing, which was in addition to $850 million in private investment it had received in previous rounds. In Fisker's bankruptcy case, Hybrid Technology LLC ranked ahead of all the equity investors as a senior creditor since they purchased the Department of Energy loan note to Fisker Automotive in November 2013. 1 2 "Driven: How Henrik Fisker Aims to Floor the Auto Industry | Magazine". Wired.com. June 22, 2010. Retrieved June 30, 2010. ↑ "Tony Posawatz replaces Tom LaSorda as Fisker CEO". Retrieved 14 August 2012. ↑ "Biography of Fisker Automotive COO Bernhard Koehler". Fiskerbuzz.com. 2009-09-15. Retrieved 2012-07-10. ↑ Bradley Berman (March 13, 2013). "Henrik Fisker Resigns From Fisker Automotive". The New York Times. Retrieved June 18, 2013. ↑ Deepa Seetharaman and Paul Lienert (June 17, 2013). "Special Report: Bad Karma: How Fisker burned through $1.4 billion on a 'green' car". Reuters. Archived from the original on August 12, 2016. Retrieved June 18, 2013. ↑ "Judge Approves Fisker Asset Sale to Wanxiang". The New York Times. ↑ Callaway, Sue Zesiger (September 19, 2007). "When a perfect Porsche isn't good enough". Fortune. Retrieved November 23, 2011. ↑ Joseph Szczesny (May 13, 2009). "Fisker CEO has plans for smaller electric car in 2010 Published: Wednesday, May 13, 2009 JOSEPH SZCZESNY". The Oakland Press. Retrieved January 19, 2012. ↑ Soyoung Kim (September 16, 2009). "Fisker Automotive targets 2011 profit". Reuters. Retrieved January 19, 2012. ↑ Migliore, Greg (April 16, 2008). "Tesla sues Fisker, alleges theft of trade secrets". AutoWeek: News & Views. Retrieved April 16, 2008. ↑ LaMonica, Martin (April 11, 2008). "Tesla Motors loses trade secrets case against Fisker". CNET News. Retrieved June 29, 2009. ↑ "ARBITRATOR FIRM EARLIER FINDING IN FAVOR OF FISKER AND AWARDS FISKER $1,144,385" (PDF). Fisker Automotive. December 11, 2008. Retrieved September 14, 2009. ↑ "Department of Energy - ATVM Loan Program". U.S. Department of Energy. Retrieved October 25, 2009. ↑ Mitchell, Josh; Power, Stephen (September 25, 2009). "Gore-Backed Car Firm Gets Large U.S. Loan". The Wall Street Journal. Retrieved February 17, 2010. ↑ "US Energy Secretary Chu Announces $528 Million Loan for Advanced Vehicle Technology for Fisker Automotive" (Press release). United States Department of Energy. September 22, 2009. Retrieved January 19, 2012. ↑ "Fisker Automotive to Buy U.S. Assembly Plant to Build Affordable Plug-in Hybrid Cars" (Press release). Fisker Automotive. October 27, 2009. Retrieved January 19, 2012. ↑ "Fisker Automotive Poised to Take Over GM Plant in Newport Federal Judge OKs Sale" (Press release). State of Delaware. June 29, 2010. Retrieved January 19, 2012. ↑ Angela Greiling Keane; Jef Feeley (February 10, 2012). "Fisker Stops Work on Car Factory After U.S. Blocks Loan". Bloomberg Businessweek. ↑ Mark Clothier; Jeffrey McCracken; Angela Greiling Keane (April 23, 2012). "U.S. Said to Hire Restructuring Adviser to Monitor Fisker". Bloomberg. 1 2 Jonathan Starkey (April 20, 2012). "Gingrich blames VP Biden for Fisker stall". Delaware Online. ↑ "Fisker CEO revamps business plan amid Karma woes". The Guardian. London. April 4, 2012. Retrieved April 10, 2012. ↑ "Fisker Automotive Appoints Tom LaSorda As CEO". Fisker Automotive. February 28, 2012. Retrieved April 10, 2012. ↑ Lavrinc, Damon (January 31, 1958). "Wired Autopia August 14, 2012". Wired.com. Retrieved February 2, 2013. 1 2 "Amid Setbacks, Fisker Automotive Closes On $392M In New Financing". Venture Capital Dispatch. Wall Street Journal Blogs. April 2, 2012. ↑ Chernova, Yuliya (November 6, 2012). "Sandy Swamped Shipment of More Than 300 Fisker Hybrid Cars". Wall Street Journal. Retrieved January 10, 2013. 1 2 Davies, Alex (November 5, 2012). "Here's Why 16 Fisker Karmas Burned During Hurricane Sandy". Business Insider. Retrieved January 10, 2013. ↑ Dolmetsch, Chris. "Fisker Automotive Agrees to End XL Insurance America Suit". Bloomberg L.P. Retrieved November 14, 2013. ↑ Hirsch, Jerry (March 13, 2013). "Management fight pushes Henrik Fisker from car company he founded". Los Angeles Times. Retrieved March 13, 2013. ↑ Berman, Bradley (March 13, 2013). "Henrik Fisker Resigns From Fisker Automotive". New York Times. Retrieved March 14, 2013. ↑ King, Danny (March 31, 2013). "Fisker hires bankruptcy team after worker furlough". AutoblogGreen. Retrieved April 2, 2013. ↑ Hirsch, Jerry (April 5, 2013). "Fisker Automotive lays off most workers, struggles to find investor". Los Angeles Times. Retrieved April 5, 2013. ↑ Keane, Angela Greiling (November 23, 2013). "Fisker to Sell Assets in Bankruptcy at $139 Million Lossn". Bloomberg. Retrieved November 23, 2013. ↑ Chase, Randall (November 26, 2013). "Fisker bankruptcy: Feds to lose $139 million on Fisker Automotive". Christian Science Monitor. Retrieved December 10, 2013. ↑ Hals, Tom (January 2, 2014). "Fisker seeks rejection of Chinese suitor it blames for its bankruptcy". Reuters. Retrieved January 6, 2014. ↑ Hals, Tom (February 18, 2014). "Court clears sale of hybrid car maker Fisker to China's Wanxiang". Reuters. Retrieved February 19, 2014. ↑ Bill Canis, Brent D. Yacobucci. "The Advanced Technology Vehicles Manufacturing (ATVM) Loan Program: Status and Issues" page 11-13. 7-5700 www.crs.gov R42064. Congressional Research Service, January 15, 2015. ↑ Jon LeSage, "Henrik Fisker Putting His Name Back On New Premium Electric Car Company," Hybrid Cars, October 4, 2016. 1 2 Muller, Joann (June 8, 2009). "The Next Detroit (page 2)". Forbes.com. Retrieved September 14, 2009. ↑ "Inside the Fisker Karma's Impossible Return From Automotive Hell". WIRED. August 19, 2016. Archived from the original on August 20, 2016. Retrieved September 24, 2016. ↑ Wes Siler (January 13, 2009). "Fisker Karma S Sunset: World's First Hybrid Convertible". Jalopnik. Retrieved 2009-12-03. ↑ Donny Nordlicht (September 13, 2011). "AUTO SHOWS: First Look: Fisker Surf Concept". Automobile Magazine. Archived from the original on November 27, 2011. Retrieved January 19, 2012. ↑ Jerry Garrett (September 13, 2011). "With Surf, Fisker Builds a Karma Hauler". The New York Times. Retrieved October 18, 2012. 1 2 Nikki Gordon-Blommfield (October 16, 2012). "Fisker Atlantic Plug-in Sedan Delayed Until At Least Late 2014". Green Car Reports. Retrieved October 18, 2012. ↑ LaMonica, Martin (April 2, 2012). "Leaked images show Fisker's Atlantic plug-in EV". C|net. Retrieved April 3, 2012. ↑ Stevens, Tim. "Fisker Atlantic EVer unveiled in New York" EnGadget April 3, 2012. Retrieved April 4, 2012. ↑ Matt DeLorenzo (April 3, 2012). "Fisker Atlantic - First Look". Road & Track. Retrieved October 18, 2012. ↑ "Fisker Expands Reach Into Canada". Fisker Automotive. February 2, 2012. Retrieved April 10, 2012. 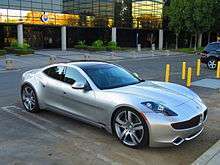 ↑ "Consumer Reports' $100K Fisker Karma dies on arrival". USA Today. March 8, 2012. Retrieved April 10, 2012. ↑ "A Year of Few Dull Moments". New York Times. December 21, 2012. Retrieved December 28, 2012. ↑ "Fisker Automotive Fact Sheet". Fisker Automotive. Retrieved April 10, 2012. ↑ "Fisker Automotive Expands Reach in Middle East & North Africa" (Press release). Fisker Automotive. April 23, 2012. Retrieved April 28, 2012. 1 2 Muller, Joann (June 8, 2009). "The Next Detroit". Forbes.com. Retrieved September 14, 2009. ↑ "A123 Shows Risks as Battery Science Meets Government Cash". Bloomberg L.P. October 18, 2012. Retrieved December 28, 2012. ↑ "Valmet Automotive announces a Letter of Intent for an Assembly Contract with Fisker Automotive" (Press release). Valmet Automotive. July 15, 2008. ↑ "Fisker Karma production at standstill". YLE. November 30, 2012. Retrieved December 28, 2012. ↑ Devereux, Pat. "Top Gear meets Leonardo DiCaprio". © BBC Worldwide Ltd. Retrieved September 20, 2012. ↑ St. John, Jeff (April 2, 2012). "Fisker Raises $392M, Ups Goal to $500M". greentechmedia. ↑ Hals, Tom (December 10, 2013). "Judge raises concerns about Fisker's race through bankruptcy". Reuters. Retrieved December 10, 2013.